If you need to increase the volume of an MP3 or WAV file and you're either away from your regular suite of audio-tweaking software or don't have one to begin with, webapp Vloud can help. The web site is incredibly simple, with a single page and a very straightforward function. 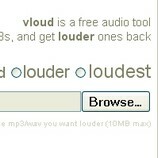 Upload an MP3 or WAV file, up to 10MB in size, and then select how much you'd like to increase the volume. There is no numerical scale, which might strike some users as entirely unscientific but the "light, loud, louder and loudest" designations get the job done. Selecting loudest will return an MP3 with a significant increase in the base sound level.